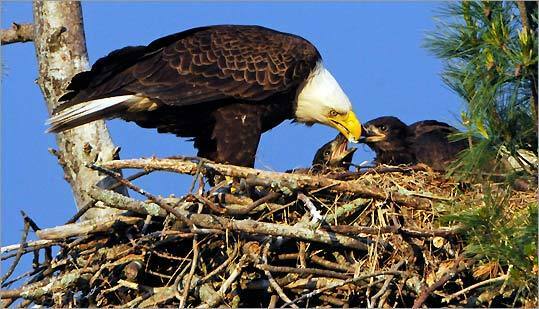 After decades of absence, the majestic birds have decided Massachusetts is a great place to raise an eaglet or two. Just a generation after they were re-introduced, bald eagles are coming back strong in Massachusetts. But at the very same time, polluter allies in Congress are playing political games with the nomination of one of the people who helped pave the way for that comeback: Longtime wildlife champion and Boston native Gina McCarthy, President Barack Obama’s nominee for Environmental Protection Agency administrator. 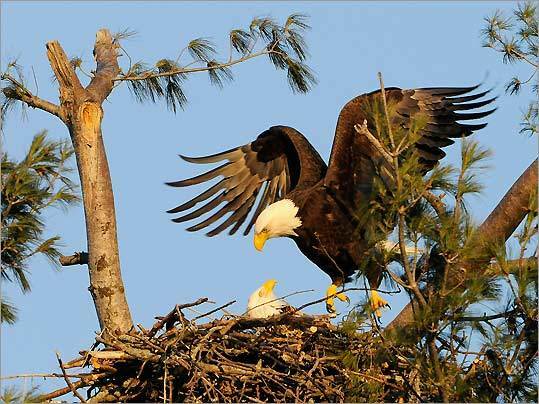 Officials from the Department of Fish and Game (DFG) verified 30 active nests in the Commonwealth, including eight nests along the Connecticut River, six at the Quabbin Reservoir and four along the Merrimack River during Massachusetts’ first Bald Eagle nesting survey. The survey, coordinated by the DFG’s Division of Fisheries and Wildlife (MassWildlife) and involving agency staff and 35 volunteers, was conducted on April 5, 2013. In addition to the principal bald eagle nesting territories along the Connecticut and Merrimack rivers and at Quabbin Reservoir, other active nests were observed at Wachusett Reservoir, and in the towns of Framingham, Brookfield, Pittsfield, Webster, Middleborough, Fall River and Plymouth. One nest failure was reported at Assawompsett Pond in Lakeville, where the wind blew a nest and two eggs out of the nest tree in early April. Additional eagle sightings were reported in Arlington, Carver, Lunenburg, Russell, Sandisfield and along the Housatonic River. Bald eagles, the largest bird of prey native to Massachusetts with a body length of about 3 feet and a wingspan of up to seven feet, have increased in numbers in Massachusetts since being reintroduced to the Quabbin Reservoir between 1982 and 1988. The species was down listed from Endangered to Threatened status in Massachusetts in 2011 and removed from the federal endangered species list in 2007. To report a bald eagle sighting in Massachusetts, email the Division of Fisheries and Wildlife’s Natural Heritage & Endangered Species Program natural.heritage@state.ma.us. Bald eagles, our national symbol & once common across North America, were pushed to the brink of extinction by the pesticide DDT, pollution from heavy metals like mercury, hunting, habitat loss, and other factors. 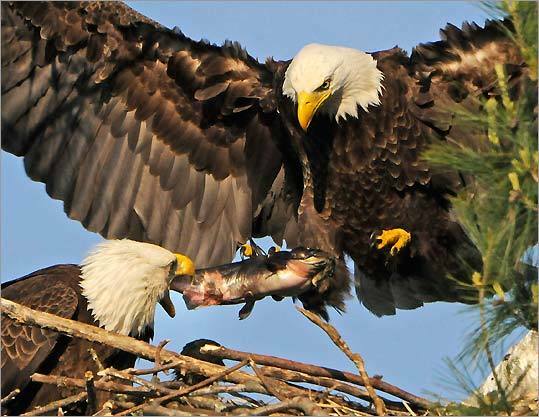 While we stopped using DDT, banned hunting, and restored what Aldo Leopold called our land ethic, mercury pollution remains a major threat to bald eagles. If a small fish eats 50 mercury contaminated plants. And an eagle eats 100 large fish. 50 x 100 x 100 = 250,000. 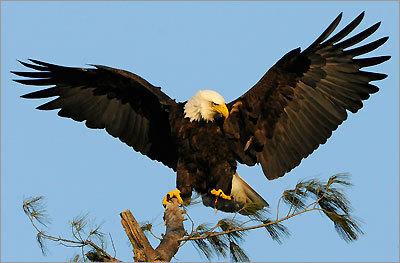 The concentration of mercury in the eagle is 250,000 times larger than it was in the plankton. Responses to "Bald eagles are making a comeback in Massachusetts! (Video)"
Very good news, even for me living in Athens Greece. We have two pair and three eaglets in our area, northern Michigan. they are so beautiful.I watch them for hours. Let's keep up the good work by omitting the mercury levels in our water ways. Happy to learn this good news. I live just a town away from Webster and I have seen the Bald Eagles flying over my neighborhood it is a hair raising experience. Let's keep up the good work by omitting high mercury levels in our water supplies.